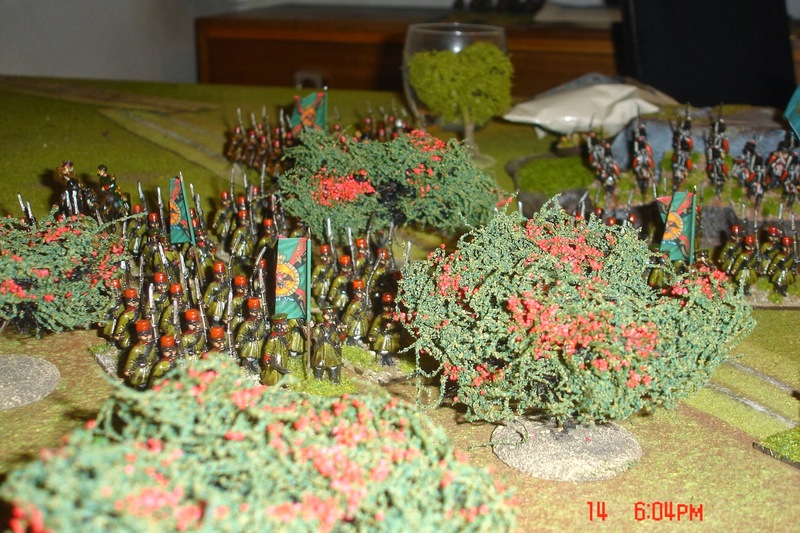 After a long wait I finally got to put my as yet untested Crimean troops onto the table. As I am still essentially housebound my mate John from the Durham club made the trip up to my place this weekend. The scenario was more or less that described in an earlier post. 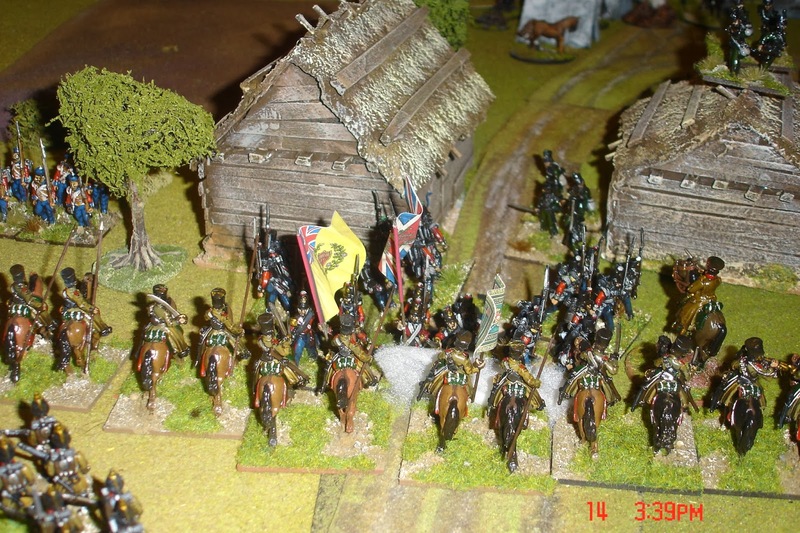 The British cavalry vedettes were camped on a river marking the furthest extent of the territory controlled by the Allies. They were guarding a camp containing a large amount of war supplies recently acquired off the Russians who had been trying to get them into Sevastopol. 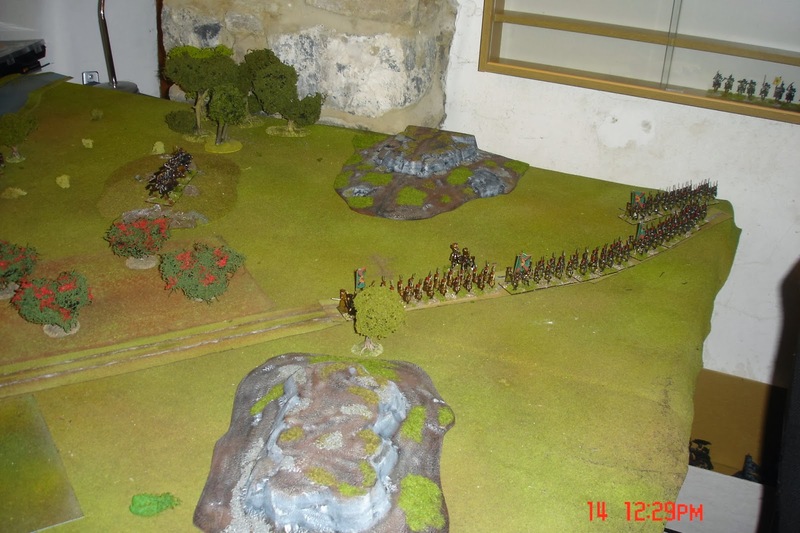 The light brigade were dispersed across the table on outpost duty. Three squadrons were formed up but two were deemed to be unsaddled and resting after their night shift on patrol. The heavy brigade were all in the camp, unsaddled and unprepared for action, preparing breakfast. Two divisions of British infantry (four brigades in all make up of the Guards and Highland brigades and the two brigades of the 'light' division) were on their way as intelligence reports had suggested that a large Russian force were heading towards the cavalry intent on driving them off and recapturing their supplies. 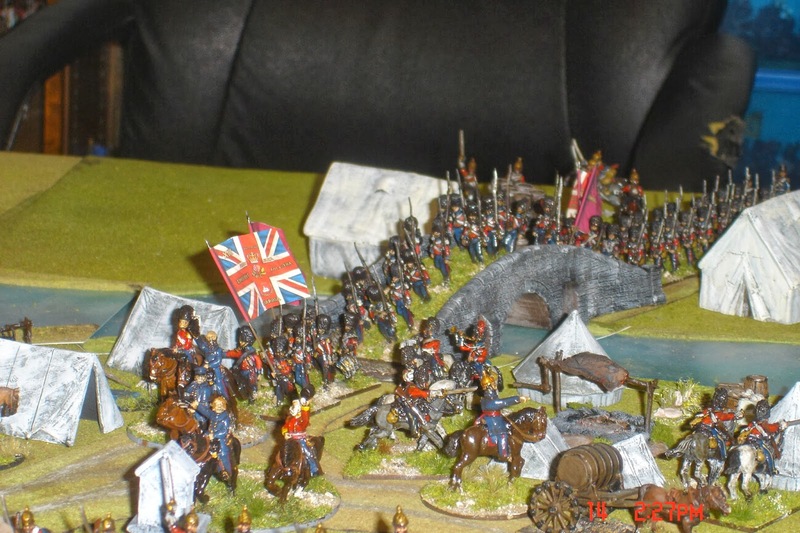 Lord Raglan of course thought intelligence something beneath the attention of a true gentleman so there was every chance that infantry would not arrive very quickly. 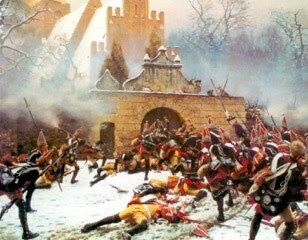 The Russians had three brigades of cavalry (one each of Cossacks, Uhlans and Hussars), in total six regiments supported by two batteries of horse artillery. These would arrive on turn 1 (subject to the right command rolls of course). 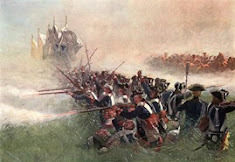 Following behind was a division of infantry, all sixteen battalions of it, supported by a battalion of riflemen and an artillery brigade of four batteries of heavy artillery. 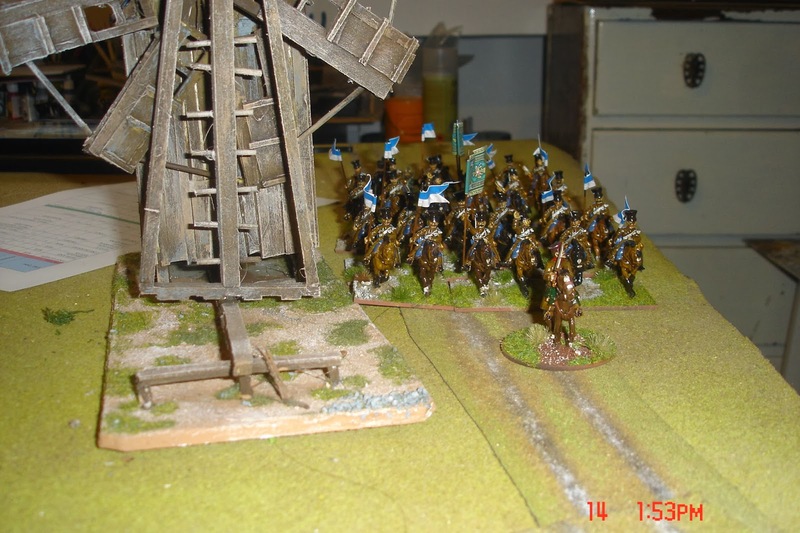 Russian batteries had 12 guns in real life, so in order to represent this on the table, each Russian battery was made up of two gun models, making eight in total; a powerful force indeed if it could be brought to bear on the enemy. 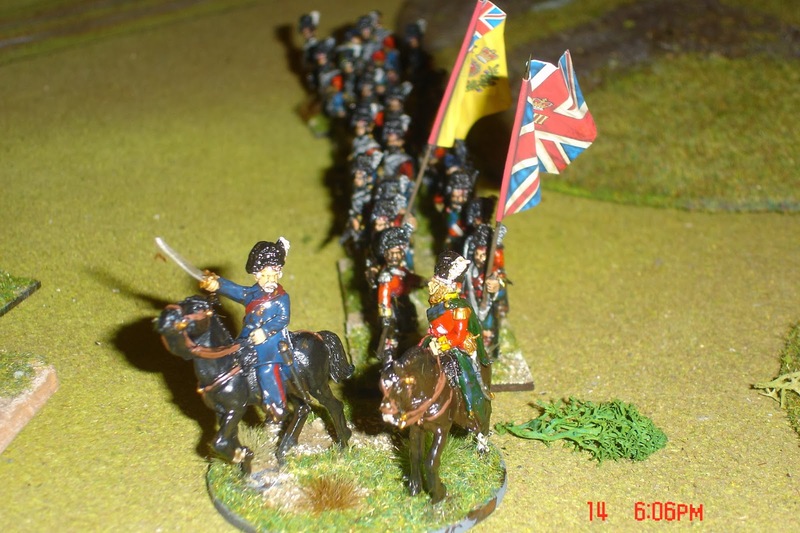 The British infantry commanders were rated 8 and Cardigan and Scarlett were rated 7. Raglan as British CinC was a stately 6. The Russian CinC was an 8 and all others were 7. Hopefully this would replicate the dreadful levels of command displayed by both sides in the real war. 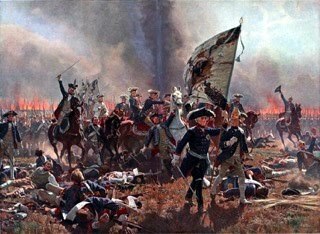 To make it even harder for the Russians, each of their two infantry brigadiers commanded eight battalions of infantry (two regiments) and two large batteries of artillery. Hard to break but equally hard to control. 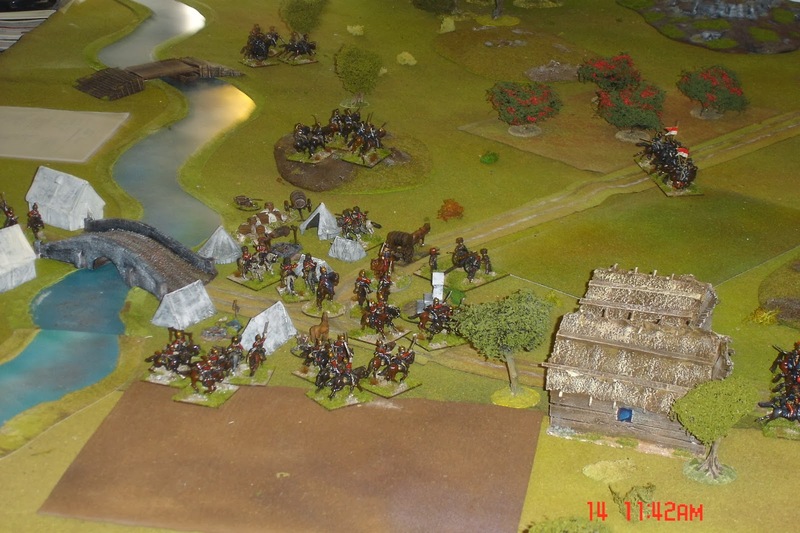 The Russians (under my command) began the game but their cavalry was hardly keen to be to grips with the enemy as the Uhlan brigade on the left failed to enter the table as did the Hussars in the centre. 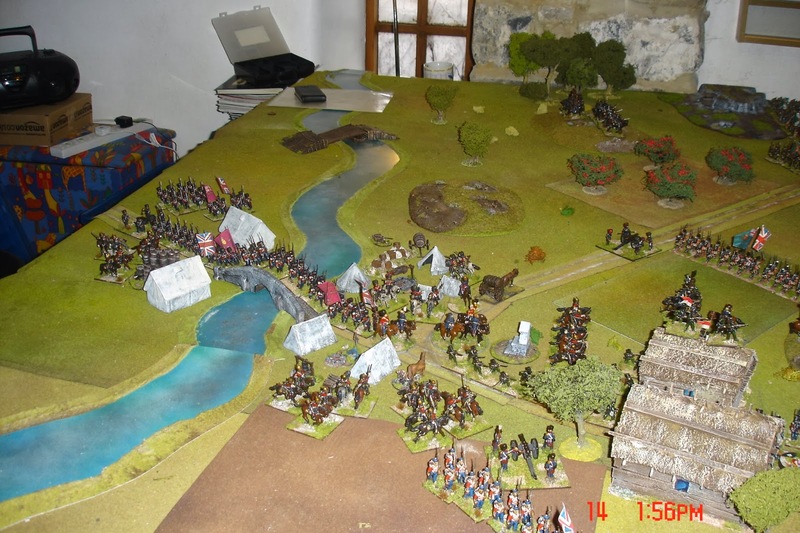 Only the Cossacks actually made it onto the table, in the centre. 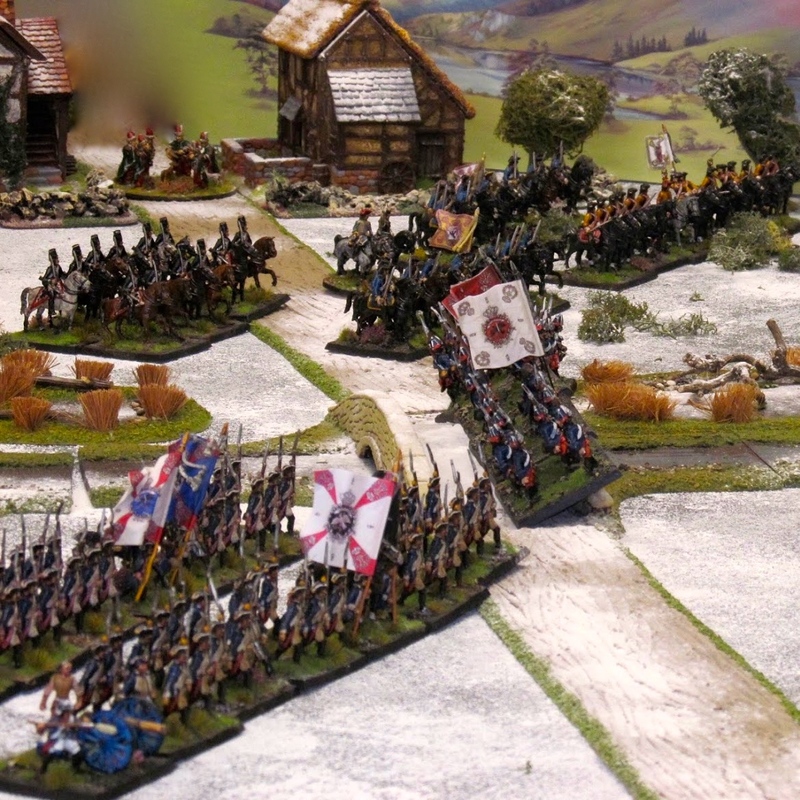 They were promptly charged by a squadron of the 11th Hussars and forced to retreat. 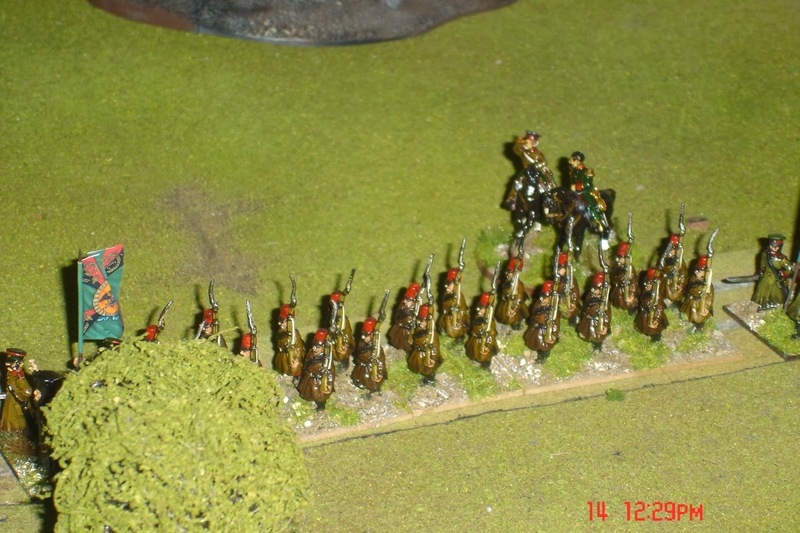 The 'Cherrybums' followed up their victory by carrying on into the second regiment of Cossacks who were broken. 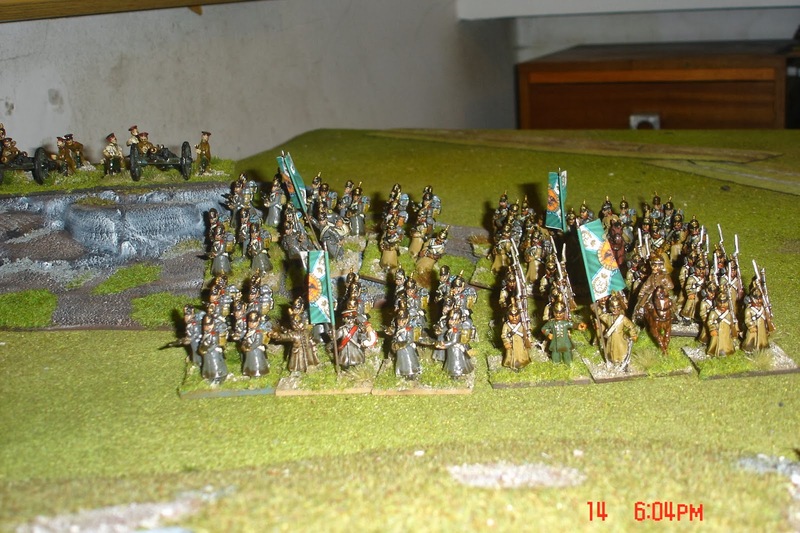 John tried to get his cavalry brigades into some sort of order but not all the light brigade passed their command tests. Worse, the heavy brigade failed to get into any state of order and continued eating their breakfast in the camp! 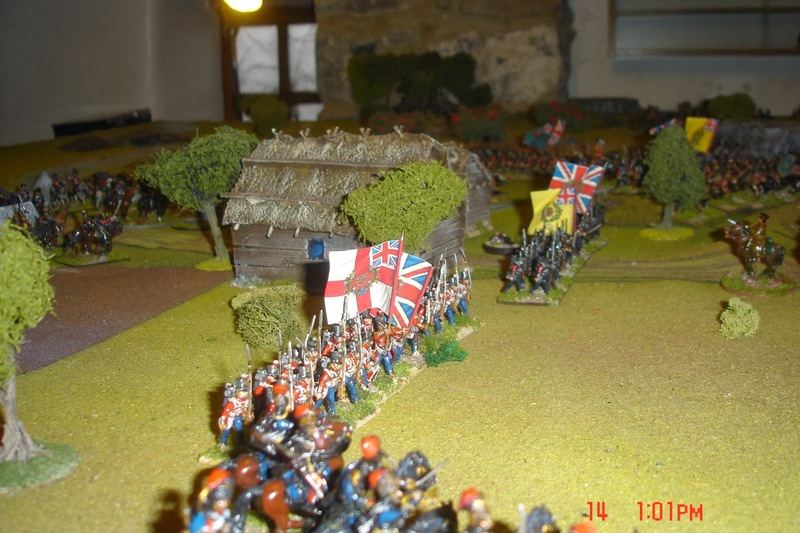 Both sides wee plagued by dreadful command dice, aided by dreadful commanders of course, but as the British reinforcements slowly began to appear it looked like the Russians were never going to appear. 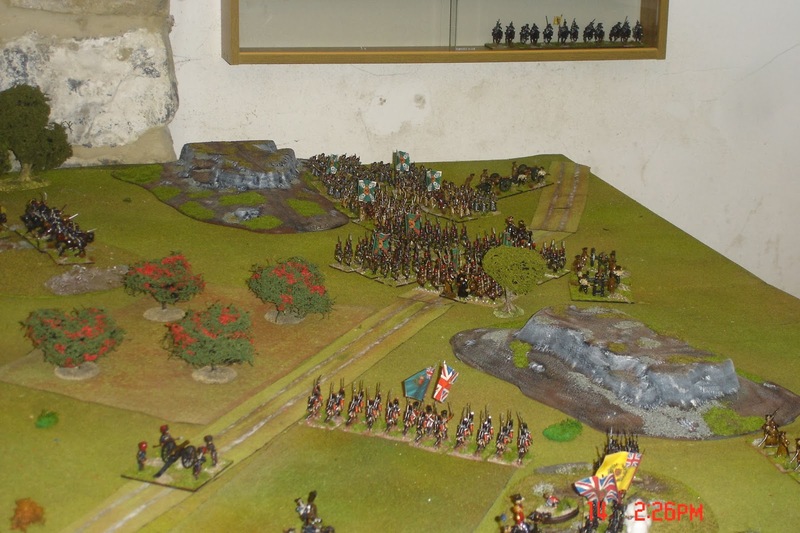 Eventually one brigade did make an appearance in the centre and very slowly deployed ready to attack, waiting for the supporting artillery to arrive. 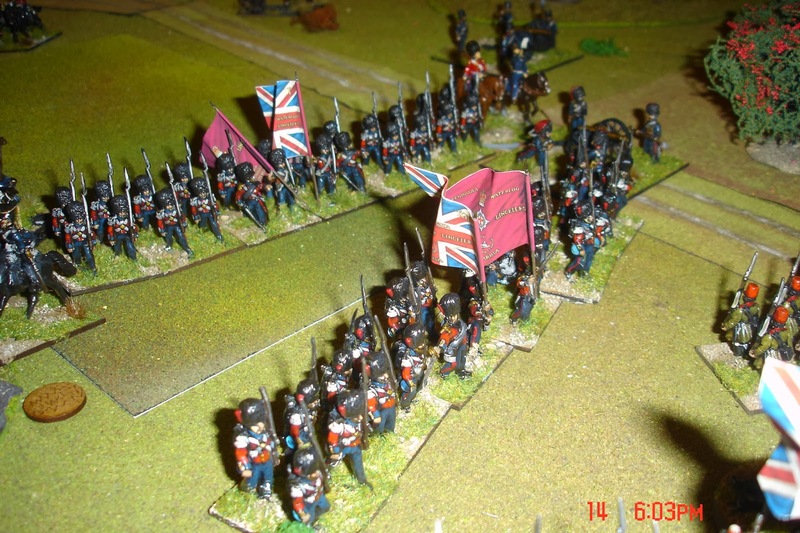 One regiment from the Russian Hussar brigade was pinning the lead British infantry btn (the Connaught Rangers) and even forced them into square at one point. 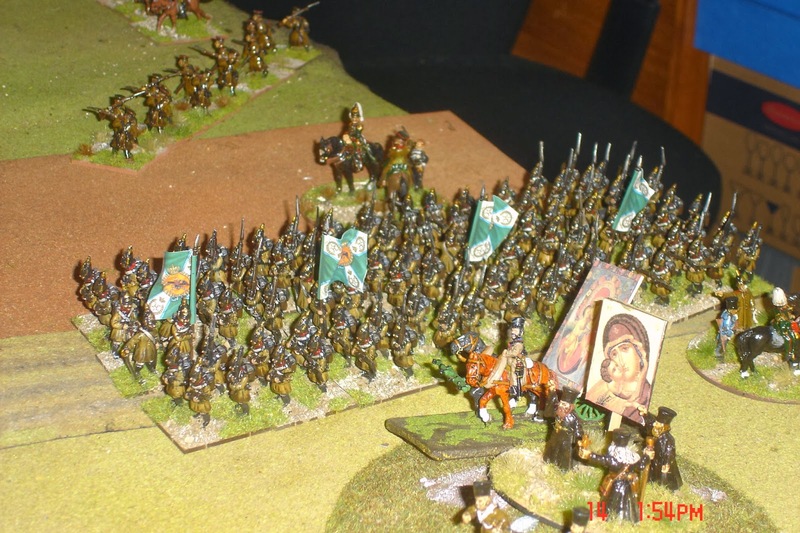 On the Russian left, the Uhlan brigade failed command roll after command roll, and in the end only entered the table as a result of a 'blunder'! 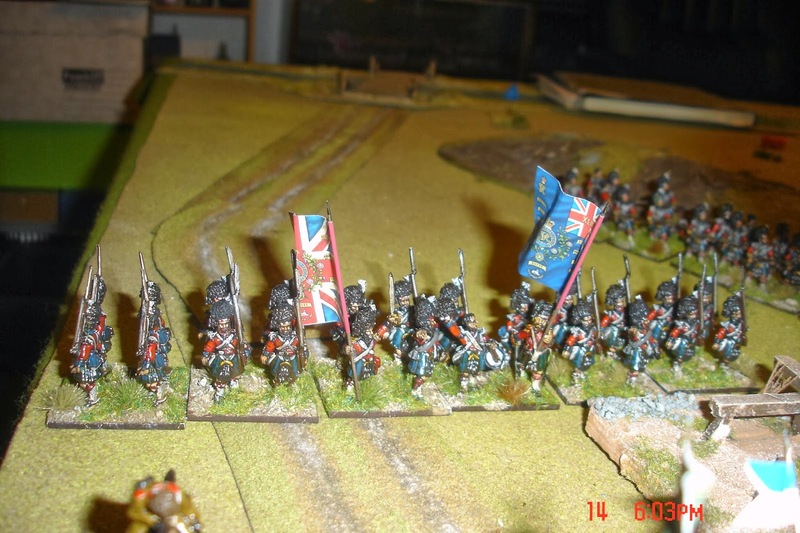 By that time any advantage had been lost as elements of the Highland brigade were well advanced and were able to stop any advance by disordering the lead regiment and halting the whole brigade. 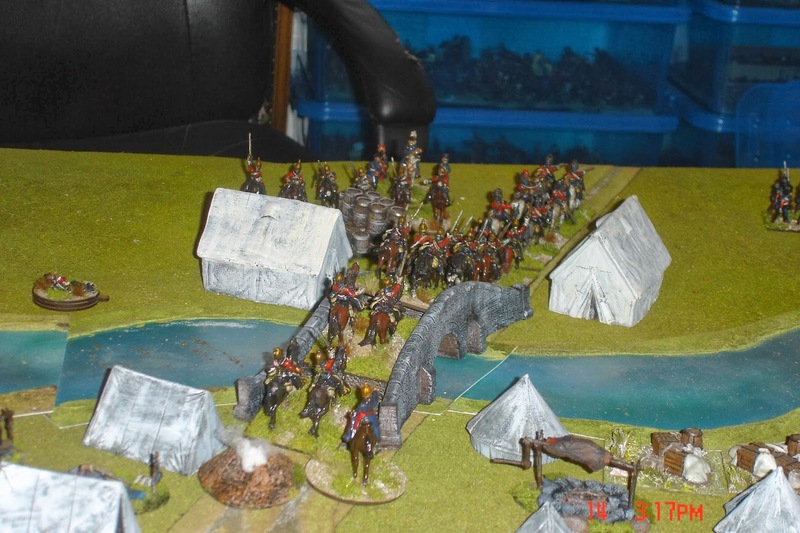 On the Russian right the other brigade of infantry had finally arrived and proceeded to advance very slowly towards the lone British battalion and supporting troop of horse artillery facing them. 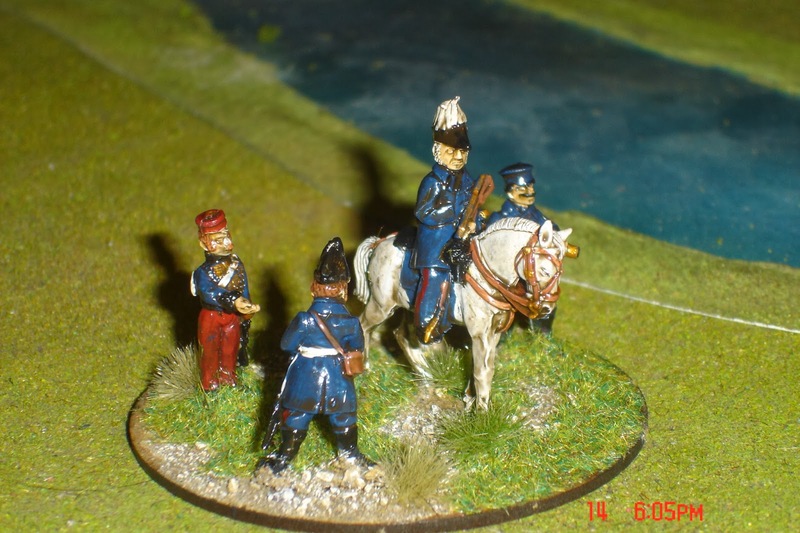 They were never really able to get into action due to poor command but they looked pretty scary from the British pov! The 19th Foot managed to catch a battery of Russian guns in the flank but the latter put up a stiff resistance and were only overwhelmed after several rounds of combat. Their were quite a few blunders in the game. Sir Colin Campbell managed it twice. First he had a battery of artillery blunder off the baseline, then the 92nd foot got lost and almost headed off the table edge. The Heavy Brigade had failed every order to form up. It took a blunder to get them to do so even though they then retreated back over the bridge! 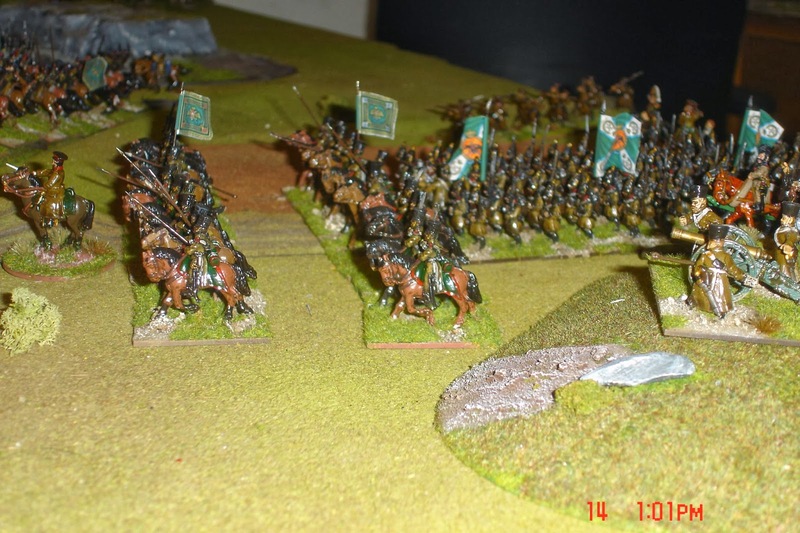 Basically, the Russian advance was far too slow and uncoordinated and their cavalry's performance was pretty rubbish even if historically accurate! 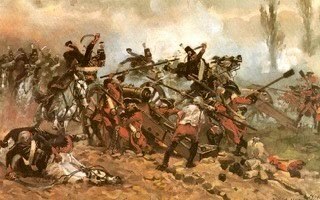 The British had their problems too, especially in activating the Heavy Brigade, but they were able to take advantage of their superior firepower and take out the Russian artillery either through long range shooting or close combat. 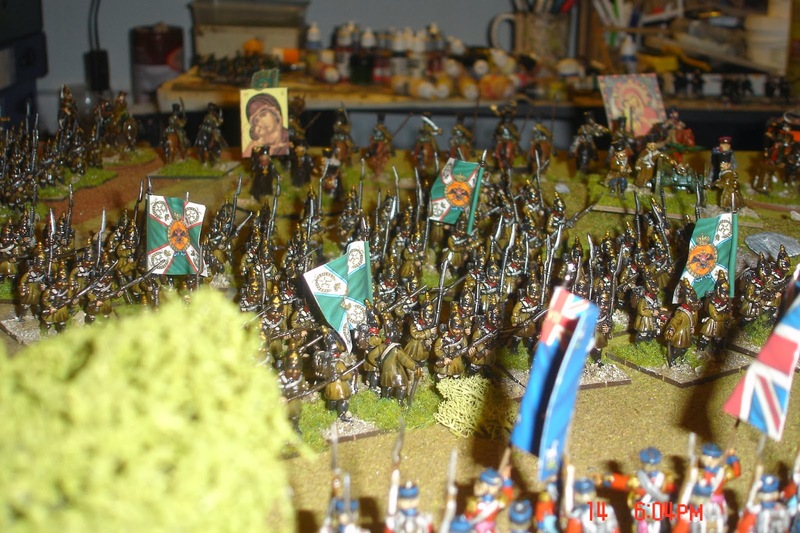 Even the 11th Hussars managed to hit a battery of heavy guns in the flank and destroy them! In the end nightfall caused the Russians to pull back as their attacks were stalling all along the front. Victory to the British. Good game. Good to get the troops on the table for the first time. BP worked although I might need to tinker slightly with the troop characteristics and reconsider the command levels as it got very slow and frustrating, but then the senior commanders on both sides were very poor. 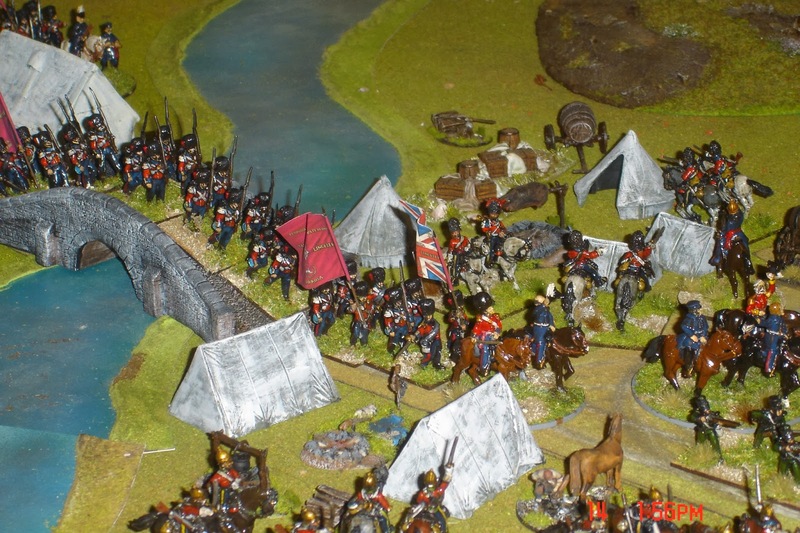 Once the armies got in close the troops' qualities shone through which is what happened in the game. Great AAR, great to see the Russians in action. Lovely stuff Colin. Am almost tempted to try BP myself! Great aar and even if it did seem like a comedy of errors at times it probably reflected the period well. Fine report: sounds like a typical BP game. 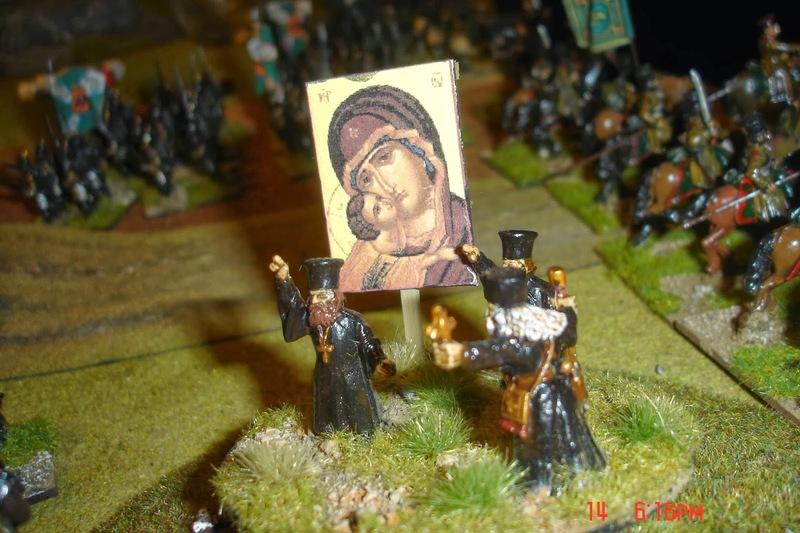 Like the Russian Icon! Lord Raglan in camp, night fall. I have had to inform Scarlett that the French were attacking our camp today, and that he was heading the wrong way. The poor man had forgotten his glasses again. He will no doubt earn a medal for the bold manner of his breakfasting, lunchen and tea, all in the face of the enemy. I do believe those light brigade fellows have been galloping about, chasing off cossacks, hussars and taking the French massed battery to turn back their dark columns. Cardigan claims he helped win the day, but he is a cad so im not sure. The shade of my old arm, has some satisfaction. What guns in deed!. Damn your Bonaparte!. 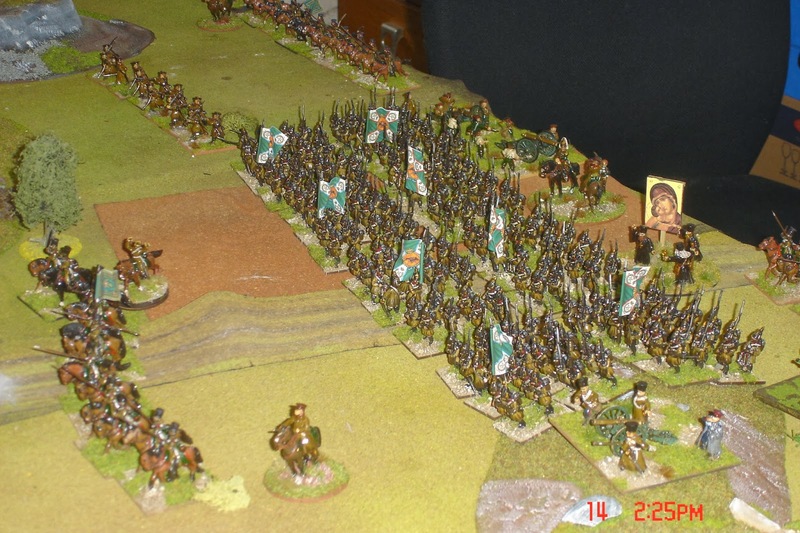 Those Irish rascals of the 88th held the village North of the camp admirably, holding off the French horse and intimidating their infantry, allowing the Heavies to eat in peace. I believe Sir Colin was also present with his highland chappies over on the right, but i m not certain, as he kept disappearing from sight. 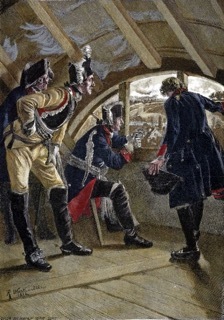 The Guards were magnificent, their mere presence enough to see off all those French lurking away on the left. Our losses are mainly in the horse artillery, the light brigade and the 1st brigade who suffered from those damnable guns. We have taken 24 cannon. God save the King. Good game and most grand to see such a fantastic wargame room. The Crimean figures looked the part, shifty Russian horse, massed and threatening Russian columns, brave battling artillery - was intimidating seeing just how many were coming towards me. 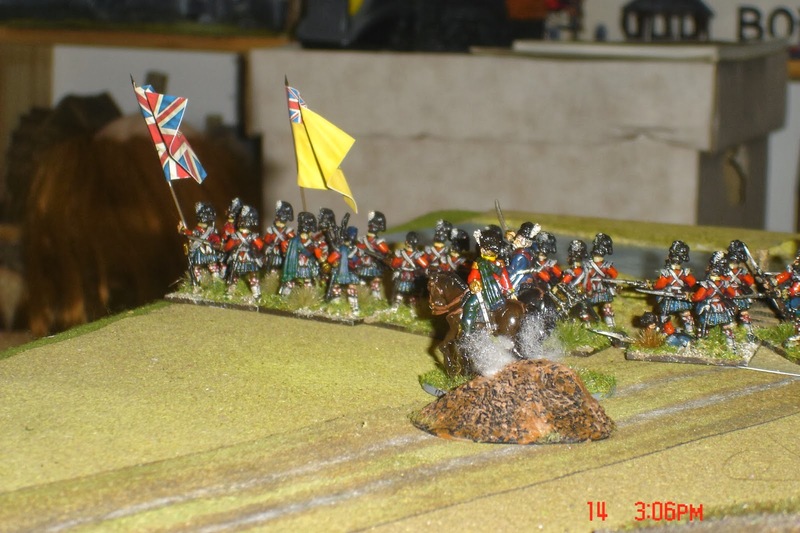 British were also the part, other than the skiving Heavies who refused to help out all game. Gallant thin Red lines shooting up the foe. BP caught the flavour of it all, although i felt the need to get in closer to deliver my volleys than perhaps was in keeping with the superior minie rifle. 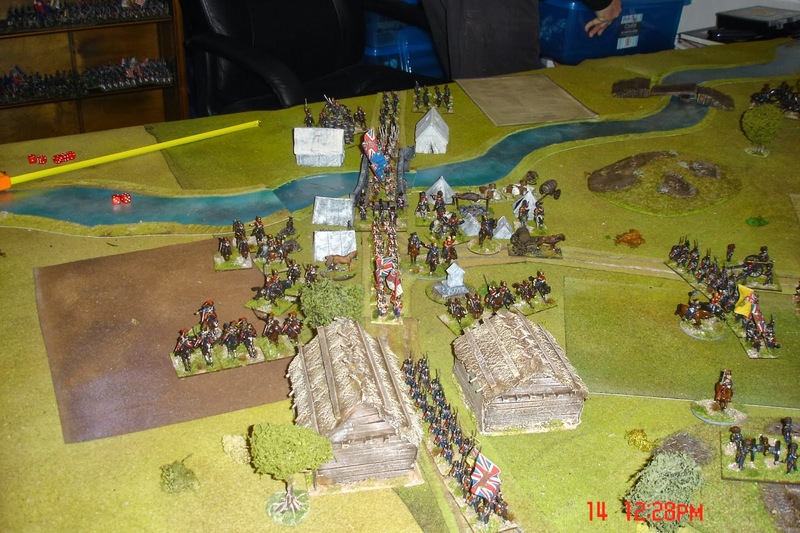 It was difficult to form a coherent battle plan, but i was lucky the British infantry matched to the guns (3 moves for first brigade), straight up the road, thro the camp and were able to deploy before the Russian masses got into their stride. 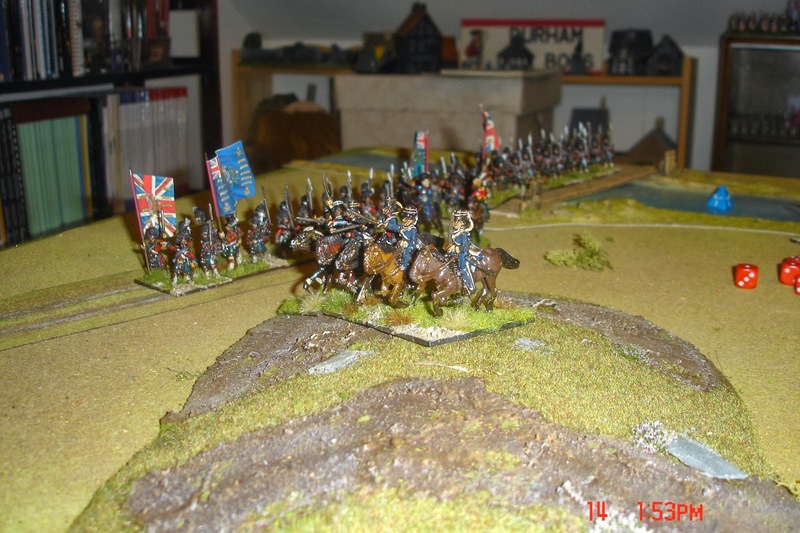 Three regts of the Light Brigade carried out decisive charges to see off the initial Russian cavalry advance, keep the Russian left pinned down and ended up riding down both heavy batteries in the last move of the game. The battle would have established the psychological edge over the Russian horse that their counterparts achieved at the actual Balaclava. Yes it was annoying being a Russian!